Every night we go to sleep with the aim to stay focused from next morning. We walk through that desired goal till the unwanted things of distraction don't hit & as it hits, our walk goes through the distraction and in different directions. At the time when we again move towards the task, the habit of ignoring the things then becomes responsible for the distraction. After some time or days, we simply realize the time spent on it was wasted. Then the surprising questions come to our mind, that how much time I spent? How I wasted time? We just be like a wake-up & decide not to do this again. But it keeps happening every time. Sometimes unknowingly & sometimes knowingly. We all know that it's not in our hands, but the fact is it's in our hands. You can stop yourself from being distracted. And if somebody still is NOT able to understand how they can do this? Or having trouble focusing at work? not able to concentrate on work? how do you stay focused? 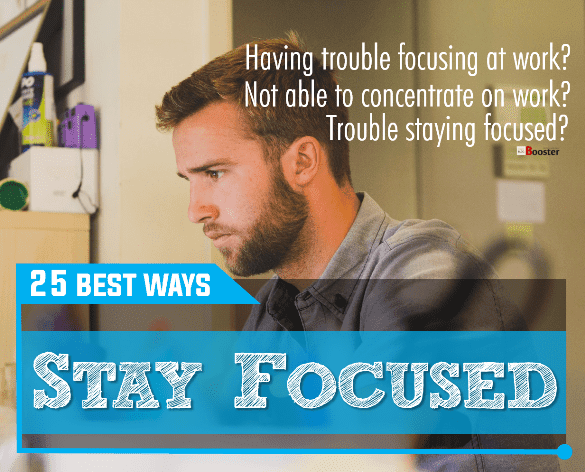 or in case need help focusing then here are some methods to stay focused by avoiding the distraction and will help you never lose focus at work/study/life. Last time we have researched and discussed Facebook Addiction | 25 Common Mistakes & It’s Solutions Everyone Should Consider While Using FB and today we are going to see how we need to sharpen our mind and how to concentrate on staying focused while we working. 1. Make your mind first. It's obvious to make your mind & thoughts prepared before doing anything. Just decide you are not gonna distracted by anything by any means. Once you've done & fixed your mind, nothing can distract you from staying focused because you know it comes from inside. Yeah, it is important to make your mind from inside of you, not just because of I said to you but you decided. It looks a pretty tough job though at the beginning, but the practice will make it fun for you. Controlling your own mind is hard, but once you controlled, you will get realized how your work becomes easy for you. All your obstacles then seem like opportunities for yours. So it's important to make your mind first to say focused in life to work. Everyone knows the exercise removes the toxins & makes our body & mind fresh and fit. A healthy, fit body, a fresh mind is always distraction free. A sharp mind can concentrate hard & productive enough. At least half an hour exercise early in the morning is key to keep yourself fresh, fit & ultimately put you focused throughout the day. It increases your stamina for work as well. The things which we do regularly create a pattern in our mind and makes it a habit and our body follow it so regularly & automatically on time. It's our body's mechanism. It's like setting the alarm to wake up early in the morning every day, and once we get the habit, we wake up automatically on time without an alarm. Making a habit of staying focused will be an extraordinary idea. Try to stay focused every time till it creates a habit for you. Once you get the habit no such other things you need to think extra will be required to stay you focused. 4. Try to make your work interesting. Try to make your work interesting. Once you started to like it, you can then start enjoying it thoroughly; resulting in maximum involvement. It enables you to take your imagination and creativity to a great level. Interesting work attracts our attention towards it. Your mind will overpass all the thought-barriers & you then try for getting new and unique ideas. And guess what; if you succeed to create something new & special on your own, then the chances of staying focused will naturally increase. 5. Planning: Work with a aim. It is so much important to work with a goal, the aim & the purpose in front of your eyes. An aimless fellow hikes everywhere with nonsense but the intended fellow succeeds towards his target even with a single step to archive his aim. By just answering your question - why you want to do this? Will energies you to stay focused. Focusing on your work gives meaning & adds value to your work. 6. Say NO to social networks during working hours. Social networking is a good medium to expose your skills & contents. Really these sites are very good if used for proper reasons. But the shame is, most of the people look at it as a source of time pass & to have fun out of it. Even someone decided to spend a particular time of the day on it, but once they open it, they sink into it like they're hypnotized. There are plenty of jokes which may give you fun, but there are some stories like heartbreaking also which can let you think that way & distract you badly. So try to stay away from social networking sites during your working hours unless & until it is necessary. If possible, you may disconnect the Internet. Using social sites correctly makes lots of difference to stay focused in life and to work. The mobile phone is must these days, but it can be even distractive too when it rings by unnecessary messages & calls. You can't switch it off as there can be some important messages & calls too, so it's better to set your phone to vibrate or silent mode when you are working. Staying away from mobile will helps you stay focused. Try to answer only important calls & avoid unnecessary messages during working hours by setting yourself in busy mode. Make a to-do list for tomorrow before going to bed or start your daily actions with a to-do list; so that you can categorize your tasks accordingly to the importance & your priorities. Make a list handy on mobile or your laptop or in a notebook to grab it quickly. Write it on a regular basis, & make sure you always have it with you. The reason is that you can able to check and modify it regular intervals & mark the tasks done once you completed it. Apparently, the primary & high priority tasks to be done with first priorities. Make a habit to check it early in the morning, it's because everyone feels fresh & intense to work in the morning as the mood is filled with a lot of energy at the start of the day. Once you complete these essential tasks, you starts feeling satisfactory & that encourages you to work a whole day and drives you to complete other tasks too. The majority of the information is exchanged through the emails either regarding your business or some other social cause. While checking the emails regarding your job or work you can't control yourself to go through the other spam emails & messages. We eagerly look at it in curiosity to know what it is and exactly that's where the most of the time you spends distracting you from actual work. The reason being, you should have separate email addresses for work and for personal use. Set them to filter all emails. Better if you can set a time & time limit for your emails. You can check it before leaving your home for an office, then again at 12 pm or after completing your important tasks. It's hard to stay fresh until the last minute of working hours, but music may make it possible. Music therapy relieves stress & gives a sign of relief, it increases enthusiasm & keeps you interested all the time. It gives a feeling of freshness. But obviously that shouldn't be loud music, but a sober, peaceful, bit quiet, sweet, melodious music can be helpful. If your job relatively more on reading then a piece of instrumental music would be a better option. 11. Take a little break. Sunday is a holiday & nobody wants to miss it because everyone wants to relax their body and release the stress that they got on previous weekdays. Also, they want to re-energize themselves for the next week for better working. Similarly, as we spend some hours working, our energy tries to slow down & so as the concentration. So to distract the distraction take a small little break only for few (2-3) minutes after every 30 minutes or an hour as you can find reliable to relax yourself. This break is to relax your body, muscles & to regulate the blood flow to all organs in the body. But be careful not to exceed those few minutes time. 12. Set a deadline for each task. While making a work list set a time limit for every task so that you can save the time which could be wasted on other unnecessary things & be honest to complete it within that limit. It's for you only. You can also punish yourself for not being honest with it. Being honest may complete your task before the time you set, which you can use to relax a bit before your next task. 13. Find the reason for distraction. Spot out the things that are diverting you from being focused. You can also find when & how they are distracting you. Is it phone calls, emails, noise in the office, structure & arrangement of your seating? Or you are hungry, tired. When you know the exact reason, find the remedy in your way & save yourself from being distracted. 14. Follow 20-20-20 rule while working with the computer screen. Whenever we stare continuously towards an object for 20 minutes, eyes start getting strain. Most of you spend most of the time working and watching the computer screen; resulting in straining of the eyes & making difficult to focus. Maybe unknowingly that results in distraction of your mind. So let me tell you a remedy that a doctor suggested following 20-20-20 rule to regain the focus & to protect your eyesight from the computer screen. The meaning of 20-20-20 is, stare at a distance of at least 20 feet from you for 20 seconds after every 20 minutes. The most disturbing thing while working especially in the office is the variety of noise that comes to your ears & the more annoying is that you can't reduce it. The sounds of ringing phones, colleague talk, something falling on the floor, if it is near to the road then the sound of horns. To focus on work ignoring these sounds also becomes a task along with your work. So putting headphones, earplugs or even cotton can make a way to this. It's just like putting a balm on the painful area, means pain is still there only your mind is diverted to that balm's cooling effect. Take heavy breakfast every morning. Heavy doesn't mean junky. It should be healthy enough & provide energy to keep you going till lunch. Our body gets more nutrients from breakfast & it is the most energized meal of the day. Missing breakfast may result in feeling tiredness, fatigue which leads to distraction. 17. You have 7-8 hours of sleep. The studies have already shown that every human need to take at least 7-8 hours peaceful night sleep to rejuvenate or re-energize themselves for next morning. If you don't get enough sleep, you won't feel active next morning & that usually happens with those who work late night, making it difficult to focus rather they don't seem to think about working. So it is necessary to rest the brain in the night after day's working. If it is not relaxed, you will feel lazy in the morning. Your focus & productivity will reflect your sleep. 18. Don't go for Multitasking. Multitasking seems more productive but simultaneously it may lead to irrelevancy & delay of speed in work. You will find yourself unable to concentrate thoroughly on all tasks, so there are more chances of all the tasks remain incomplete. Handle one task at a time & think of the next once you complete the present. Doing this may benefit you to relax a bit after completion of the task to re-energize for the next. If you are aiming 10 different targets, then there are almost a null chances of hitting even single, but if you are concentrating on a single object, chances are more to aim it properly & accurately. 19. If you get stuck, keep it aside & jump on next. Not all the days are same, & by the same ways, not all the moments are productive. At some points in time, you may get stuck, no thoughts striking your mind. Then think this time you need to stop that task & keep it aside for some time. Relax your mind, your thoughts a bit & start a new task. This is because there is a possibility of, the idea might strike your brain later then you can return to it if you want to while keeping you running towards completing your all the tasks. Meditation is said to be a prime tool to increase concentration. It helps to relax the mind by clearing all negative thoughts. It's been said that a 20-minute meditation every day can increase your performance. According to scientists meditation may improve some brain functions related to attention. If you find yourself unable to stay away from the Internet or social media, then try an focus app to do so. Here also you can make the use of technology. There are some focus apps which can block the websites or black out the computer screen background allowing only one thing to look at a time on which you are working on. They are also able to track the time you spend on surfing the web. 22. Appreciate & reward yourself. The self-appreciation increases the self-value in self-eyes & nothing more motivated than this to stay focused. Yeah, appreciate yourself for completing a task in time & reward yourself to motivate your self-confidence. I love green tea & I used to reward myself a cup of green tea on completing a task in time. Every time it motivates me to finish the task in time so that I can enjoy a cup of green tea. In such a way the task looks so easy & allows me to enjoy each and every task from to do list. 23. Have your choice of workplace. Working from different locations every time takes more time to focus as things are new to adjust. But such a case doesn't seem to happen if you work from one place every time. The reason being the things become familiar & habituate. It gives comfortable feeling & nothing has to adjust. Decide your choice of workplace. It increases your natural tendency & allows your productivity to free flow. 24. Work on standards place. The focus depends on a bit upon the structure of your workplace also. It should be clean & clutter-free, easy to use & handle. It should be a quiet place but in most cases that doesn't happen as if you are working in the office. As said above, you can make it quite for yourself only by wearing headphones or earplugs. It's always ideal to have a separate cabin if possible. 25. Put some pressure on yourself. Just like boss used to behaves with his employees, you also can put a fair amount of pressure on yourself. It's because of the pressure every time you're forced to do it & it's a human tendency to work well under pressure. Pressure creates a must do situation. It might also help you to get in time, work in time, sleep in time. Now I can think that you have got the right ways to stay focused. Now it's not only in your hands but also in your brain. Give a try to these ways, I am sure you will be habituated to stay focused. So stay focused & be productive.